Volumes 1 & 2. This edition: Volumes 1-2. Carl Fischer Festival Performance Solos. Classical. 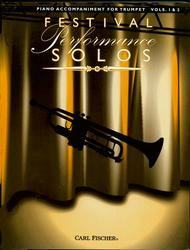 Piano accompaniment book. With piano accompaniment. 162 pages. Carl Fischer #O005518. Published by Carl Fischer (CF.O5518). ISBN 825842263. 9x12 inches. Transcribed by L. Klemcke; Gerardo Iasilli.